I've always wanted to be Coco Chanel for Halloween and after browsing through my closet and treasure chest of trinkets I was able to make the perfect costume. I'd love to actually make a legit Chanel suit one day but while time is limited this will do. 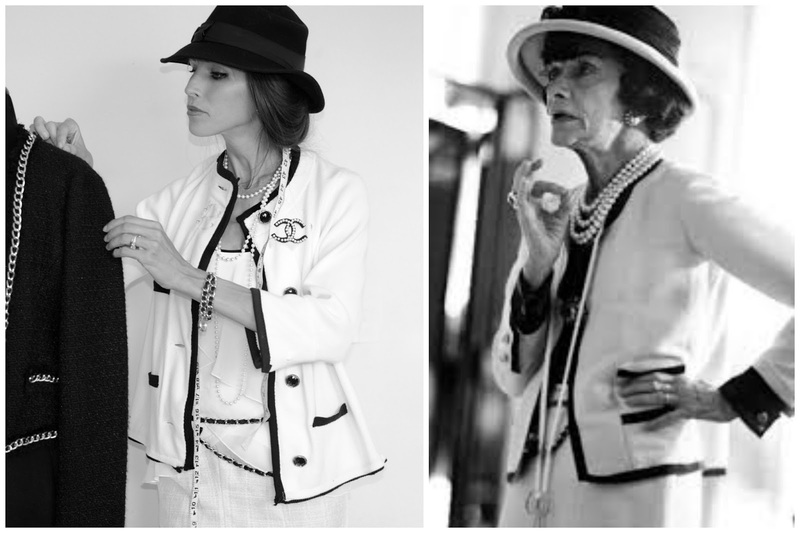 Gabrielle "Coco" Chanel, known for her trademark suits, little black dresses, and witty quotes. 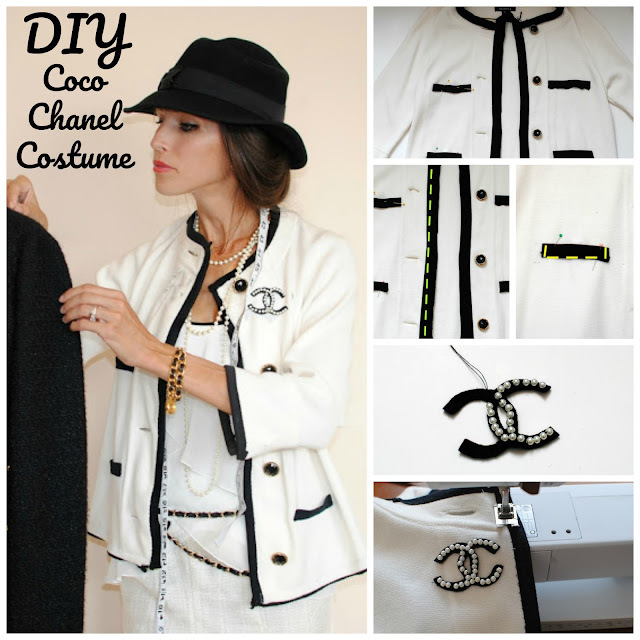 Chanel still to this day is ruling the fashion industry with these timeless pieces. Her amusing comments and style has made her even after death a top fashion icon. Chanel's life was anything but glamorous as a child, she was orphaned by her father at the age of 12. Raised in a Catholic Orphanage that taught her to sew and how she made her start into design. Little did they know what kind of empire she'd create with these skills, actually the most profitable fashion empire of all time. What I love about Chanel is she stayed loyal to her style and design from the beginning. She never was persuaded by trends, perhaps this is why she's quoted saying "fashion fades, style is eternal" or "I am fashion." What a fun character she was and someone on my top list of people I wish I could meet. Here's how I DIYed my costume. I wanted her signature white and black suit. 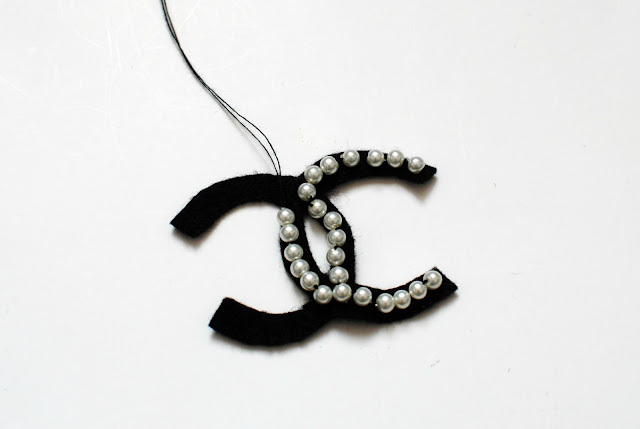 This was something Chanel wore often with a hat/pearls/and her cig. Start with thrift stores. 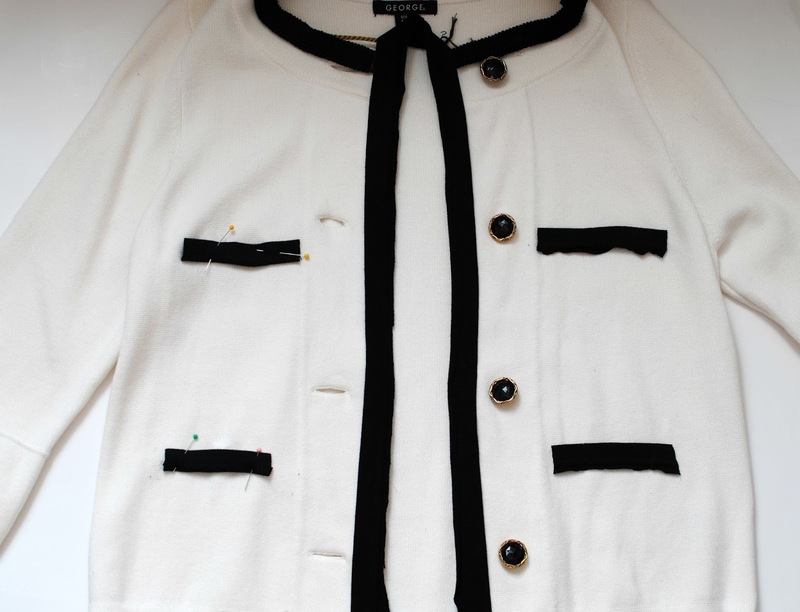 You may be lucky enough to find a off-white tweed skirt and tweed cardigan. If you're really lucky you may even find one with the black trimming. I couldn't find either so I made everything from scratch. I had a white cardigan already so start with something basic like this to embellish. I used some tweed I had for a the skirt. Start with a blank cardigan. 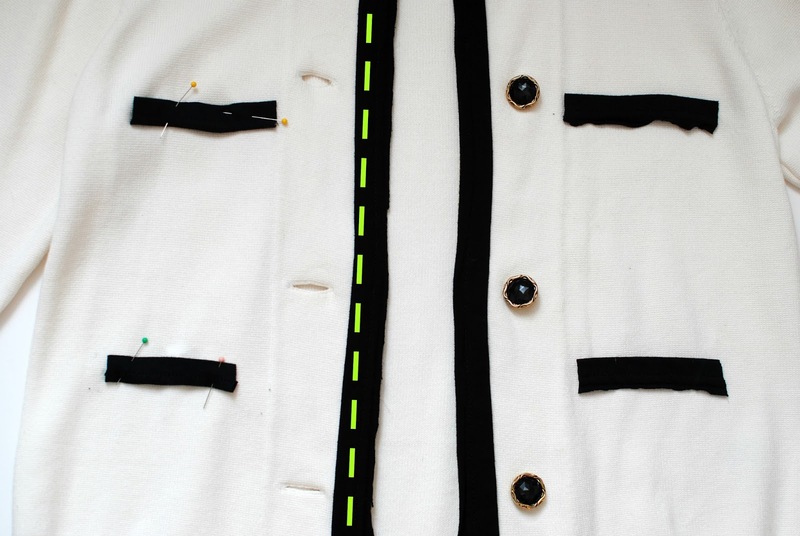 I removed the white buttons and added black. I then placed 4 sets of trim using black twill tape but you can use any type of trim on the sides. I pinned the trim on the edges all the way around even on the sleeve hems and bodice hem. Everything was black hemming on her classic suit. For the "pocket" trims I stitch around like this and left the top part open. 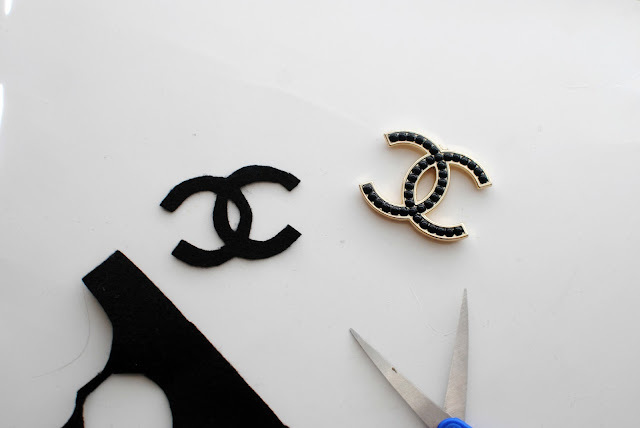 Most don't have a Chanel logo brooch. So to make one just use felt and trace onto the felt and cut it out. 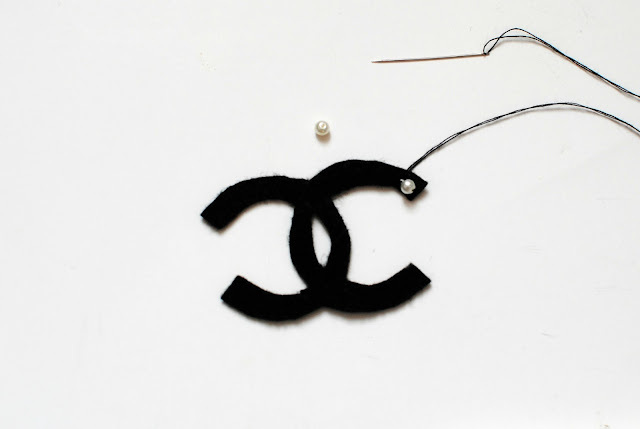 To make it not look like a fake, felt logo I added a string of pearls by simple sewing them around the logo. 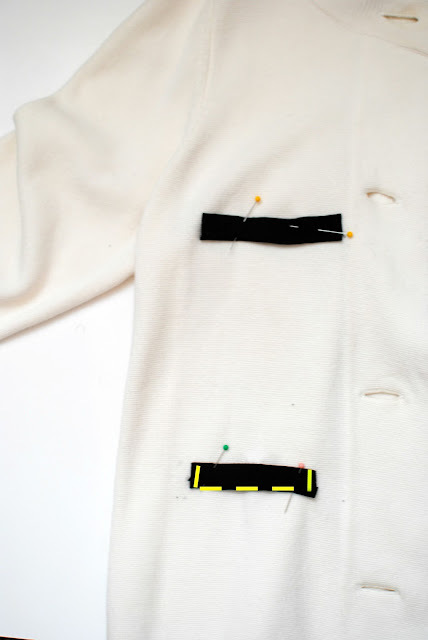 Hand stitch it on the cardigan. Again you can glue but Chanel would roll over in her grave over this. She always wore a belt with her signature gold chain and black ribbon. You can simply make this by pulling black ribbon through the chain. Now add the accessories: pearls, hat: she started as a millinery, fake cigarette…she was known for smoking handless while working on her couture gowns. Then finish it off with a set of pearl earrings, her signature set of scissors, I did a measuring tape because I have baby Louis to hold. In the words of Chanel, "if you want to be different be ready to be copied." Do you have any plans to make your costume…? It's a tradition in our home to design and sew our Halloween Costumes. You can purchase a wig for this look, yet remember that the vast majority of your hair will be pushed into the cap, so it's a bit much. In the event that you intend to utilize your regular hair, twist your hair with a wand/little hair curling accessory/straightener. Check this article https://midnightpapers.com/blog/leadership-essay if you wanna know how to write a good leadership essay. We have a lot of requests this time. Are you feeling consumed and suffocated owing to the sort of burden that is laden onto you? Then, rather than staying complacent in your little stress ball, students should make it a point to make contact with essay writer online which is provided by Essays Tigers. This service has amassed such stature and status in the industry, as they remain customer-centric in their approach.